It's padded! It's Pink! It's made from cotton candy! It's (probably) delicious! Modern art often leaves a lot of folks scratching their heads, mainly because it's so open to interpretation. This particular piece of artwork, however, would no doubt entertain its audience since it also served as a tasty snack. Well, so long as the audience liked carnival junk food. Back in November, Performa Arts had a Russian-themed exhibit called "Red Party." The event was "inspired by the groundbreaking artists of the Russian Revolution" and New York artist Jennifer Rubell created "Padded Cell" as part of the event. The piece featured 1,600 cotton candy cones. Padded cell is an 8'X16' freestanding room constructed of basic building materials, with a single door that contains a plexiglass window. 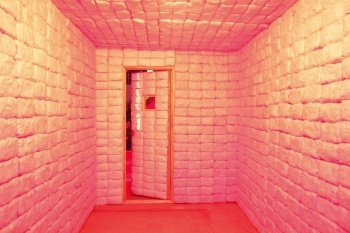 Inside, the walls and ceilingare padded with pink cotton candy, and a bare light bulb hangs in the center. The door is opened at 9pm, but the interior is visible through the window throughout the evening. The Red Party's main dinner is served inside a Russian-themed constructivist set, and Padded Cell acts as an escape from that, an all-American funhouse that is at the same time confining, threatening, claustrophobic. It is an object that addresses the dark side of pleasure, the price of pleasure, the possibility that pleasure is its own punishment. I'm not sure I'd find this piece threatening or representative of the dark side of pleasure. I'd probably just find it delicious.